Odessa (population 1,122,000 in 1995) is the capital of Odessa region of Ukraine, a port on Odessa Bay of the Black Sea. The third largest Ukrainian city after Kiev and Kharkov, Odessa is an important rail junction and highway hub, as well as a major industrial, cultural, scientific, and resort center. Grain, sugar, machinery, coal, petroleum products, cement, metals, jute, and timber are the chief items of trade at the Port of Odessa, the leading Ukrainian Black Sea port. 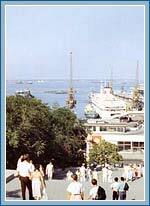 Odessa is also a naval base and the home port of fishing and Antarctic whaling fleet. The city's industries include shipbuilding, oil refining, machine building, metalworking, food processing, and manufacture of chemicals, machine tools, clothing, and products made of wood, jute, and silk. The relatively mild climate of Odessa draws visitors to the city's many health resorts. Odessa has University (1865), Opera and Ballet Theater (1809), Historical Museum (1825), Municipal Library (1830), Astronomical Observatory .1871), Opera house (1883-87), and Picture gallery (1898), as well as other museums and theaters. Besides the university, students are attracted to several institutions of higher education in the city, including medical schools, marine academy, and music conservatory. Ukrainians, Russians, Jews, and Greeks predominate in Odessa's cosmopolitan population. Odessa was founded in 1794 by Empress Catherine the Great. A colony of Ancient Greece may have once occupied the site of the city, and Crimean Tartars traded there in the 14th century. The city suffered heavy damage during World War II, and many residents perished during German and Romanian occupation.